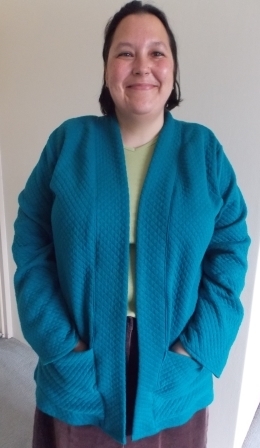 I have wanted to make a knit fabric cardigan for a long time and I confess to having more than a few of both PDF and paper patterns in my stash for them just waiting to be made. 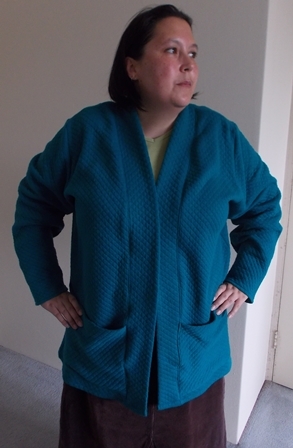 When I first read A Beginner’s Guide To Sewing With Knitted Fabrics the Kinder Cardigan really stood out. 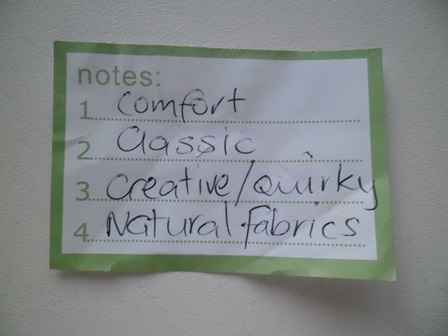 It was the kind of cardigan that I was looking for – it was simple yet sophisticated looking, it had pockets, you could make it in different length variations. Having it in the book it was right in front of me allowed me to read through all the instructions step by step and I became itching to make one after discovering it was actually pretty easy to sew. 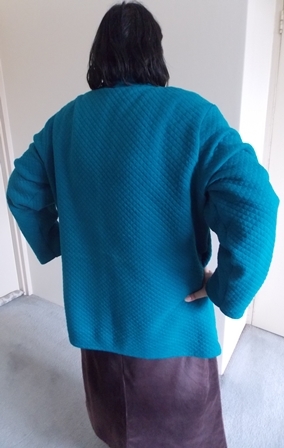 The suggested fabric for this pattern is more of a heavier knit, the final garment is more like a jacket that holds it shape rather than a slinky cardigan you can squish up and stuff into your handbag. I have since heard the term “Coatigan” which as you can guess is a cross between a coat and a cardigan, I think that is a good way to describe this pattern… well the one that I have made anyway. 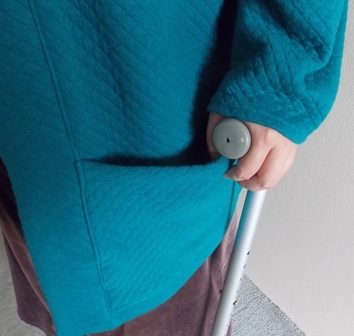 This teal fabric was not my original choice of fabric, I had brought the same fabric in a blue colour and only discovered I didn’t have enough when I laid out my pattern pieces and couldn’t fit them all on it. I made an emergency Sunday morning online purchase from Zebra Fabrics who I didn’t realise was doing a wonderful pre Easter offer and express posted all purchases that weekend so they would arrive in time for the long weekend. I don’t make a habit of hanging around post offices but I was at my local post office the time my parcel arrived at it and as the staff were sorting through the parcels and saw mine so they called out to me to collect it. Instead of Easter eggs I got a parcel of squishy fabric instead for Easter, as I don’t eat chocolate I was very happy about that. To cut out the pieces I pinned the pattern pieces for the front, back and sleeves to the fabric. The neckband and pockets were rectangles so I just traced them out directly on the fabric using a chalk marker. Tracing the pattern pieces out onto fabric was very quick to do and something I am now doing a lot after seeing it done at the Cashmerette retreats. I did place a few pins to keep the layers together when I cut them out. This was a super easy garment to make. I cut it out and stitched it all in one day. I followed all the instructions as per the book but I did do a few minor things differently. I used stay tape on the back of the shoulder seams after learning the importance of using it at the NSW Industry Day. I top stitched the bottoms of the pockets once I stitched them on and I hemmed my sleeves whilst they were flat. I find it difficult to hem sleeves once they are in the round when it is in an area that small, why add stress to your sewing if you don’t have to. I made the mid-length uncuffed with pockets version in the largest size. I thought I was making the full-length version but I misread the pattern where it says to add the extra length so I ended up with the mid length. I am actually ok with that as I think any longer in this fabric would make it look like a dressing gown. This length gives me full coverage over my lower back which is perfect. I stitched all the seams on my over locker and used my sewing machine for the top stitching, hemming and joining the neckband pieces together. 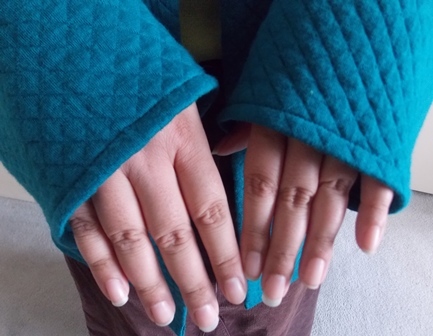 The fabric is a stretch cotton knit which has a quilted texture. It sheds a lot when you stitch it so the edges on this fabric do need to be finished properly. 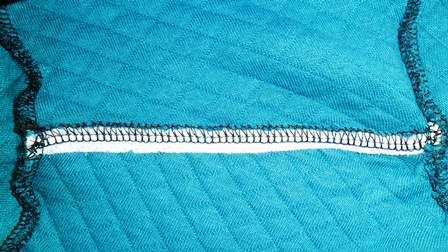 My over locker and sewing machine had a tinge of teal to it, I even got tiny fibres up my nose when I used a tissue I discovered. This is very comfortable, very snuggly. The style is very simple and a piece that you can wear from year to year with any items in your wardrobe. The quilted texture of the fabric adds a little bit of interest to the garment making it that little bit different to what you normally find. As it is a cotton so I can wear it and not feel itchy or hot, it looks heavy but it is very light but warm at the same time. I love my teal kinder and have worn it a lot. After making this first version the only thing I would do different is raise the pockets by at least 1/2″ I just guesstimated where to place them and it looked pretty close to the one in the book (it is actually marked on the pattern) because of walking with the crutch handle I do need the pockets a little higher or the handle will get caught on it. So far these haven’t been an issue but I know for next time. This is getting a lot of wear this winter. 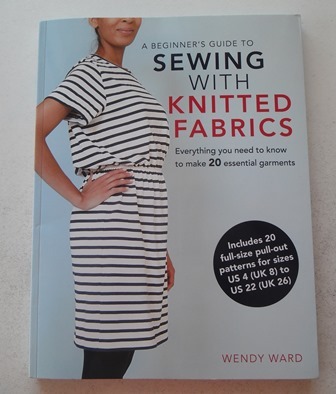 Cardi looks great, I would have thought that knitted fabric would be hard to manage due to stretching but that doesn’t apprear to have been a problem judging by the finished project. Enjoy wearing.